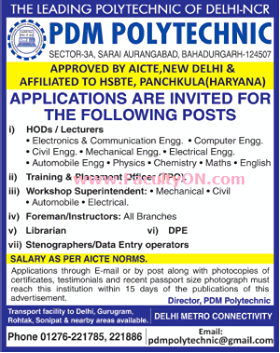 PDM Polytechnic, Bahadurgarh has advertised in Times of India newspaper for the recruitment of HOD plus Lecturer jobs vacancies. Interested and eligible job aspirants are requested to apply within 15 days. Check out further more details below. About College: P.D.M. Polytechnic, a self-financing institute made its modest beginning in 1996, since then it is rapidly gaining recognition & popularity among the discerning academic circles.The Institute is committed to the development of professional engineers to face the challenges of the rapidly changing industrial world. The Institute is recognized by All India Council for Technical Education (AICTE), New Delhi and Affiliated to Haryana State Board of Technical Education, Panchkula. Presently we offer three year Diploma Courses in the disciplines of Computer Engineering, Electronics & Communication Engineering, Mechanical Engineering & Civil Engineering.